Main falls, 50m NW of Carrickaness Bridge, The Black Water, Co. Tyrone; fall-maker and vertical face comprises 2.3m of calcareous sandstones of Drumowen Sandstone Member (stratotype) of Ballyshannon Limestone Formation. The stratotype section of the Drumowen Member exposes its full thickness and its lower and upper contacts. Blocks on top of fall-maker comprise basal limestone of Ederny Limestone Member of Ballyshannon Limestone Formation. consist mainly of fawn to pale-brown and pale grey calcareous, medium-grained bedded sandstones that weather with a pale pink stain and a characteristic carious (pock marked) weathered surface. Vertical Skolithos tubes extend downwards for some 0.3-0.35m from a level near the base of the sandstone, into the underlying blue-grey crinoidal limestone bed. Below the base of the member are about 1.7m of strata that consist mainly of blue-grey bioclastic limestones but do have finely parallel and cross laminated tops and bases to some beds. On the south bank of The Black Water at Carrickaness Bridge, Carrickaness Rock consists of 2.7m of the Ederny Limestone Member. 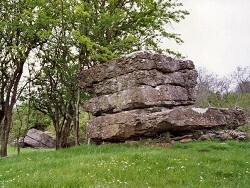 The Carrickaness Rock (in background) is formed of 4 beds of limestone of Ederny Limestone Member of Ballyshannon Limestone Formation; low feature in foreground formed of sandstones of Drumowen Sandstone Member. Detail of the Carrickaness Rock showing limestones of Ederny Limestone Member. This is an outlier of the Member, resting on the Drumowen Sandstone Member which is about 2.5-2.7m thick and forms the low rock ridge some 20m east of Carrickaness Rock. The sandstone forming the ridge is largely decalcified but is clearly laminated with small scale cross laminations and abundant bioturbation structures including vertical burrows. The occurrence of sandstones in the Ballyshannon Limestone Formation is unusual and restricted to very thin horizons. Located stratigraphically below the Ederny Limestone Member, at the 'same level' as Crockanaver Limestone Member which consists of shallow water grainstones, it is tempting to speculate that the sandstone was deposited in a near-shore proximal location, at the same time as the grainstone shoals which formed in shallow agitated water, but further away from the shoreline and therefore from the source of clastic (mainly quartz) detritus. Perhaps the shoreline of the Carboniferous sea, in Ballyshannon Limestone times was located north or northeast of Drumquin on the fringes of the present Sperrin Mountains. The Drumowen Sandstone Member is the only sandstone unit known to occur in the Ballyshannon Limestone Formation. 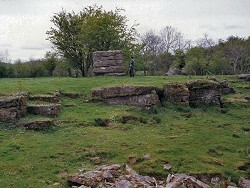 Its outcrop is confined to the Drumquin area of Co. Tyrone and is best exposed in its stratotype section at Carrickaness Bridge. Key Site 1176 - Subarea-3; Kesh-Omagh. Approach: The stratotype section is located in Carrickaness Townland 3.25km west of Drumquin. See 1:50,000 O.S. Sheet 12 (Strabane).